This post has been in my head almost since I started this blog. Just like many of us DIYers have our favorite, trusted, and go-to tools (like my beloved ‘lil stubby brush), many people who like to cook also have these must-have tools. I am by no means a chef or a gourmet cook, but I have cooked enough to form strong opinions on a number of items that have immensely helped me learn and be more successful in the kitchen. Most of my cookware is nonstick, however, I do have three pieces of stainless because sometimes you just need a stainless pot. And sometimes, you need just a teeny tiny little one. Out of all of my saucepans, my 1.5qt stainless gets the most use. There are so many recipes that you just need a little bit of something cooked in: browned butter, sauces from a roux, caramel, base for meringue…just about any recipe that calls for constant whisking or stirring I do in my little stainless pan. This is in conjunction with #8 on this list. I always use that kind of whisk in this little pot for these sort of recipes because I don’t want to worry about scratching my nonsticks with it, or want to clean a big pot for a little bit of stuff. I love fresh herbs, but HATE chopping them up. Green all over my cutting board, pieces stuck everywhere, never can scoop all of it up, ugh. I hate it, so when I discovered these my jaw hit the floor. Yes yes yes yes and yes! Now I just cut my herbs right over the dish and there’s no cleanup except rinsing the shears off. Plus they look badass. I initially just had the covered cake pan on here but since I have this whole set and love all of it, and use all of it constantly, so I may as well share it all. In addition to the set, though, I have since gone back and bought an additional covered cake pan and two more of the large baking sheets. I almost always double my dishes so with these, I can easily just plop the lid on and we can take one of the dishes to work or to a friend’s place. Honestly, I think almost every single piece in this set should have a lid. Banana bread in a loaf pan to go please! Ok, this one took me a while to come around to price-wise, but seriously, once I splurged on stainless, I’ll never go back to plastic. It is just so much nicer to use these sturdier, heavier, more substantial pieces than the plastic ones. Our plastic pieces always lost their ink so I had to just guess which was which sometimes, they weren’t heavy so they always would topple over and spill the contents, they wouldn’t fit inside jars, and they were just plain ugly. My favorite is that these spoons (the link, not in the pic) are narrow so they fit right into spice jars. Also something that took me a while to actually spend money on. I had this cheapy dollar-store “zester” for a while that was totally wrong. The holes were so small that it would take me like four lemons to get a teaspoon of zest, and even then it was mushy. I couldn’t understand why so many recipes called for doing this craziness, then I saw a cooking show use a true zester like this. I trashed my cheapy one and got a Microplane immediately. Such.a.difference. Now I have zest like I’m supposed to have. Works awesome for parmesean and chocolate too! This dude doesn’t really need an explanation and is, and will always be, my #1 kitchen gadget recommendation. I love that I can toss everything in and then clean up a little bit while it’s doing its thing. I have my grandmother’s from the 60s but the design is still pretty much the same, just with a few snazzier options. If you can spring for the Professional line, DO IT, the performance is amazing (that’s what my cooking-genius aunt has). I will also highly suggest getting an extra stainless and/or glass bowl so that you can whip cream and eggs and such after preparing a batter without having to transfer and clean one bowl. There is a slight size difference with the bowls from my old one and the current versions so beware of that if you purchase or inherit an older one and want additional bowls (I can’t find another one to fit mine). This makes my list because I live in south Texas and I love cooking with citrus. I did finally stop manually squeezing and converted to a citrus reamer a few years ago, but I still had to do it over a strainer to catch seeds. This guy though is one step above that in that it strains out the seeds for you, then you just pop the top off and pour the juice out. The base collects right at 1/2 cup of juice. This guy is best friends with #1 on the list. It is your gravy, browned butter, and roux pro. It gets in the edges of the pot, thoroughly scrapes the bottom, and stands up on it’s own in the pot if you need a second. This was one of the first items my aunt Tracey bestowed upon me when she taught me to cook. We call it the “boingy” because it’s bouncy. I am a steadfast believer in the “mise en place” practice and it has saved me so.much.time beforehand. I have eight of these guys and need about eight more honestly. Measure out your stuff ahead of time in these, then you’re free to just dump it in when you’re cooking, no clumsy and rushed measuring in the heat of things. I was always a big toaster oven fan, but then I saw these and it has saved me so much time, headache, and probably a few bucks on our energy bill. No more heating up the big oven for some veggie roasting, baking just a few cookies, keeping things warm, or reheating our pizza. It heats up super, super fast and has some awesome settings. Food just tastes better in these things. I don’t know what LeCreuset does to them but it’s magic. I had the dutch oven on here first, but I love my covered casserole just as much so I couldn’t choose between them. You can make absolutely anything in the dutch oven, and the lid on the covered casserole is where it’s at. No more foil-covering (I hate wasting foil) and I can store it in the fridge when we’re done instead of messing with plastic containers. Not to mention the colors they come in now are awesome (oh matte cotton, I will have you someday). 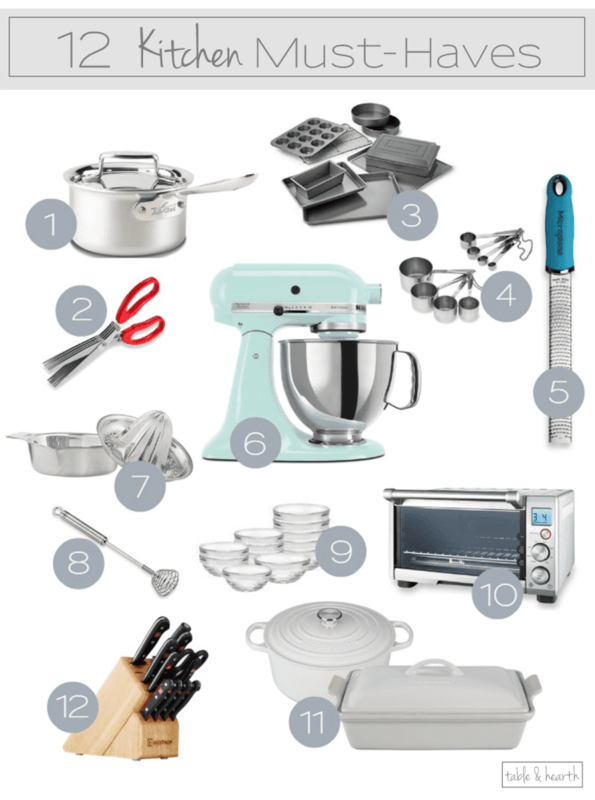 These and the Kitchenaid are pillars of your kitchen if you want to cook. I always rolled my eyes at needed good knives, we never had any growing up, but then I took our wedding registry and my budding cooking obsession as an opportunity to go for it and they are absolutely invaluable now. The first slice with these things and I was like “HOW did I never go for this?! ?” Get a set with the steak knives and kitchen shears too. The kitchen shears get as much, if not more, use than the knives do around here. There are a ton more goodies out there which I’m sure many would argue should be on here, and that some on here shouldn’t be, but I absolutely adore each and every one of these items and use them on a weekly basis, so I’m sharing them with you :) I will definitely share with you any future gems I come across too! This was a helpful post Emily! After we finish our kitchen reno, I want to update a lot of my worn out kitchen tools. Not sure why I have felt the need to hold on to my plastic measuring tools from 1997 for so long. :)Definitely time to let those go! I’m so glad Anni!! A pretty new kitchen deserves pretty new tools :) My cups were my husband’s from 1997, not even my own..eeek! I’m going to add the whisk to a wish list for my husband! We have most of the other ones and I totally agree with your picks! Our go-to knifes are the Shun Knives (which are pricey but amazing!). Shuns are awesome Ashley! I’ve seen different variations on the whisk, some not as long as this one, but as long as it’s got that flat bottom it’ll do the awesomeness. 1. My cast iron skillet. I am trying desperately to abandon the nonstick cookware..too much chemicals. My husband cannot give up his Teflon though so I have two small skillets for him. It took me awhile to get used to using it but I love it now that it is broken in and seasoned. 2. Our Vitamix. At first I was hesitant to spend the money, but our cheaper blenders kept breaking down and never whipped up such a uniform smoothie like our Vitamix. I also use it to make flour from whole grains, banana nice cream and nut butters! It has been a fantastic addition to our kitchen! By the way, my dad and Grandma Polly bought me my kitchenaid mixer when I was in high school. I make all our breads so it is one of my favorites too! Ooo, good suggestions too Jessica! Thanks!! 2. I keep hearing rave reviews about these! Huge bonus points that you make ice cream in yours, I didn’t know you could do that! You just have to keep using the pan and oiling it. The more you use it the better it gets. It will become a favorite. Don’t give up. ;) Maybe use it for bacon or something else greasy until you get it where you want it. Also, I clean mine with soap and scrub sponge after a friend (former chef) shared a very informative article with me on caring for cast iron. I immediately dry it on the stove on high and then if it isn’t shiny once dry it gets a little bacon grease or coconut oil to season it up. Have you seasoned it completely and put it in the oven? And it’s banana ‘nice cream’ – vegan ice cream made from frozen bananas. It’s delicious, creamy and much healthier than ice cream. You can make it in a food processor too. Pinterest has a ton of flavor ideas too. I even saw a float recipe using fresh juice as the soda part. We buy the marked down bananas in bulk and have them in the freezer for smoothies and this little treat. The kids love it! And I just thought of another essential in my kitchen. The good old crock pot. It’s a workhorse here. I always have chicken broth, yogurt or a meal cooking in one of my two. :) It’s a rare week that goes by that I don’t pull one (or both) of its storage spot. THANK YOU Jessica! And no, I’m ashamed to admit I haven’t done that yet :/ I didn’t do my proper research on what it really needed before I used it the first time, so when it was a disaster I got mad at it and have been scared of it ever since. But now I will be a proper cast-iron mom and give it some TLC, I promise. Aaaah, banana NICE cream, I get it now. That sounds amazing this time of year! And yes, touche on the ‘ol crockpot. The husband loves to use ours on Sundays but I wish we could/would use it more than that. It’s definitely a lifesaver for alot of folks and man, you can do all kinds of stuff in them now! What a great list. I definitely agree that my stand mixer is a must have. Next on my list its good knives!! haha. They are definitely a close second as my favorites. It is such a difference, you won’t believe it! I do too Ariel! I love to see what folks use in their kitchens :) You will be so addicted to using the herb shears, I’m sure there’s a ton of other uses for them that I haven’t even thought of yet, you can probably even use them for crafting! Such great “must haves” for the kitchen, Emily! We get tons of use out of our KitchenAid mixer and covered casserole dish. Loving the new look on the blog too. :) Happy Fourth friend!! It’s definitely one of my most loved possessions, behind the husband and cat ;).